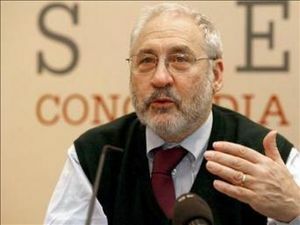 Joseph Stiglitz is an American economist and Professor of Economics at Columbia University, New York. He is also a member of the Committee on Global Thought and co-founder and Executive Director of the Initiative for Political Dialogue at Columbia. He was awarded the Nobel Prize in Economics in 2001 for his analysis of markets with asymmetric information. He was Chief Economist and Senior Vice President of the World Bank. He has served as an economic advisor to President Barack Obama. Stiglitz, a Nobel Prize-winning economist, “mentored several members of Obama’s economic team, including budget director Peter Orszag, 40, and Jason Furman, 38, deputy director of the National Economic Council,” according to Bloomberg. A Party of European Socialists Delegation with PES President Poul Nyrup Rasmussen; Par Nüder, MP, former Finance Minister, SAP, Sweden and Geir Axelsen, Vice Finance Minister, DNA, Norway visited New York and Washington D.C., on 4-8 February 2008, to meet with Congress members (Barney Frank, Chair of the House Committee on Financial Services and George Miller, Chair of the house, education and labour committee) and well known economists such as Joseph Stiglitz, Economy Nobel Prize, to discuss about Financial markets reform. PES President Poul Nyrup Rasmussen visited New York and Washington on 10-16 November 2008 to meet with Dominique Strauss Kahn, Director General of IMF; Paul Volcker, Chairman of the Federal Reserve; Joseph Stiglitz, Co-President IPD; Barney Frank, US House of Representatives; Chair-House Financial Services Committee and many other people. In 2009 Joseph Stiglitz served on the Board of Sponsors of the Federation of American Scientists. Statement endorsers included Joseph Stiglitz, Columbia University. On September 23 2008, the Socialist International Presidium adopted a statement on “the Global Financial Crisis and the G2o Pittsburgh Summit.” In addressing the current phase of the global financial crisis and the upcoming G20 Summit in Pittsburgh, the Presidium received a report on the work of the SI Commission on Global Financial Issues which had held its most recent meeting in New York two days before, on 21 September, under the chairmanship of Professor Joseph Stiglitz. Strengthening automatic stabilizers through the enhancement of social protections and increasing the progressivity of the tax structure would contribute both to the stability of the economic system and a broader sense of social justice and solidarity. This crisis has frayed many critical aspects of our social compact. Ordinary citizens have been asked to bail out wealthy banks, who have used some of the proceeds to pay bonuses to their executives. Workers have been asked to take cutbacks in wages, while the contracts of those of highly paid executives of financial institutions have been treated as if they are sacrosanct. In some cases, the profits of the banks have been based on exploitation of the least educated members of society. In some countries, growth has been based on exploitation of the environment; given the pace of climate change, the growth path of the world is clearly unsustainable. The crisis should be an occasion for reflection, for re-establishing the social contract among the members of society today, between the developed and developing countries, and between this generation and future generations. The Socialist International Commission on Global Financial Issues met in New York on 31 March in advance of the G-20 summit to be held in London to address the global financial crisis. The Chair of the Commission Professor Joseph Stiglitz introduced the discussion, "which covered the global social democratic response to the crisis.| Considering the new phase of the crisis affecting emerging and developing countries and the urgency of the situation of many people around the world today, the Commission issued a message to the leaders of the G-20 calling for decisive international action. Criticising the inadequacies and fallacies in the economic system which have led to unbridled financial practices, damage to the environment and inequality around the globe, the Commission called for a new set of rules for the world economy, a set in which citizens are not subservient to the market. It stated that it was necessary to guarantee that markets serve people’s needs, instead of letting them bear the worst of the crisis. Demanding that global leaders act now to restructure, re-regulate, and reform the global financial system, the Commission called for new standards governing financial activities by function, the establishment of mandatory new standards for transparency and timeliness, as well as the chartering of a new World Finance Organisation to set global standards and globalise enforcement. The Commission also called for the closure of tax havens. The Commission, established by the Socialist International Presidium at its meeting at the United Nations, New York, at the end of September 2008, brings together political leaders, ministers and experts from around the world. Attending in New York were: Professor Joseph Stiglitz from the United States, Nobel laureate and Chair of the Commission; Anatoly Aksakov, Member of the Board of the Russian Federation Central Bank and Member of Russian State Duma, For a Just Russia Party; Cuauhtémoc Cárdenas, Founder of the Party for Democratic Revolution, PRD, Mexico and Honorary President of the Socialist International; Elio Di Rupo, Leader of the Socialist Party, PS, Belgium, and SI Vice-President; Eero Heinäluoma, Finnish Social Democratic Party and SI Vice-President; Fathallah Oualalou, Former Minister of Finance, Socialist Union of Popular Forces, USFP, Morocco; Antolin Sánchez Presedo, Member of the European Parliament, Spanish Socialist Workers’ Party, PSOE, Spain, and Markus Klimmer, Senior Economic advisor to the Social Democratic Party, Germany; George Papandreou, President of the Socialist International and Luis Ayala, Secretary General of the Socialist International, worked alongside the members who took part in this second meeting of the Commission. The members of the Commission were also joined by a number of academics from the US and Europe, who assisted in an advisory capacity. The Initiative for Policy Dialogue is a globalist group which is funded by George Soros’ Open Society Institute. Joseph Stiglitz is the co-founder and president of the Initiative. The Fundacion Ideas, or IDEAS Foundation for Progress was created during the 37th Federal Congress of the Spanish Socialist Workers Party (PSOE) in 2008 to establish a “think-tank with the capacity to bring novel progressive ideas to the arena of political and social debate in an ever changing world.” Its mission is to identify challenges and opportunities and offer innovative and imaginative solutions that are at the same time rigorous from a scientific point of view and politically deliverable. American members of the Fundacion Ideas Scientific Committee include Joseph Stiglitz, Jeffrey Sachs, George Lakoff, Jeremy Rifkin, Pippa Norris. This page was last modified on 27 August 2015, at 04:16.